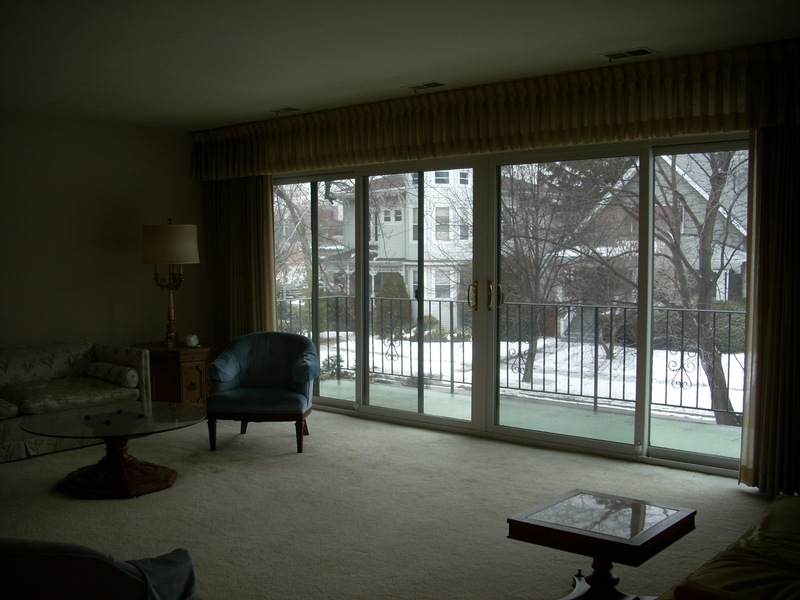 It’s not a great picture, but this is what the living room looked like when we made our offer on the apartment. 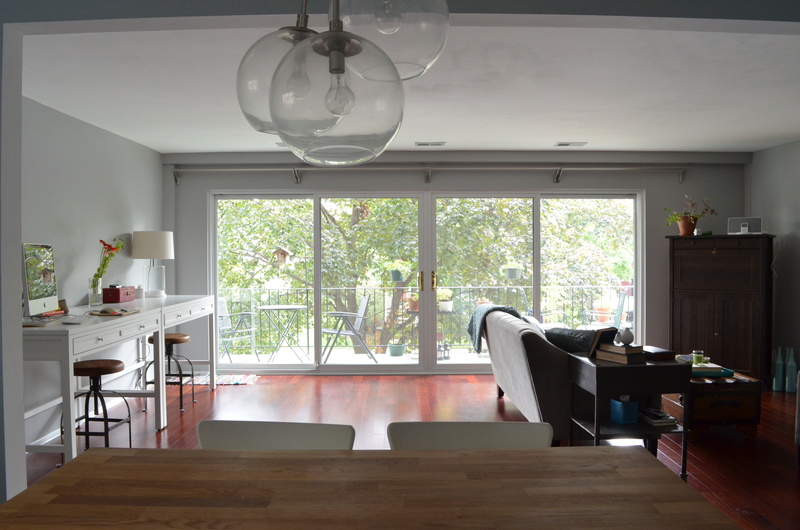 The living room is huge…which is awesome, except decorating it has been a big challenge. 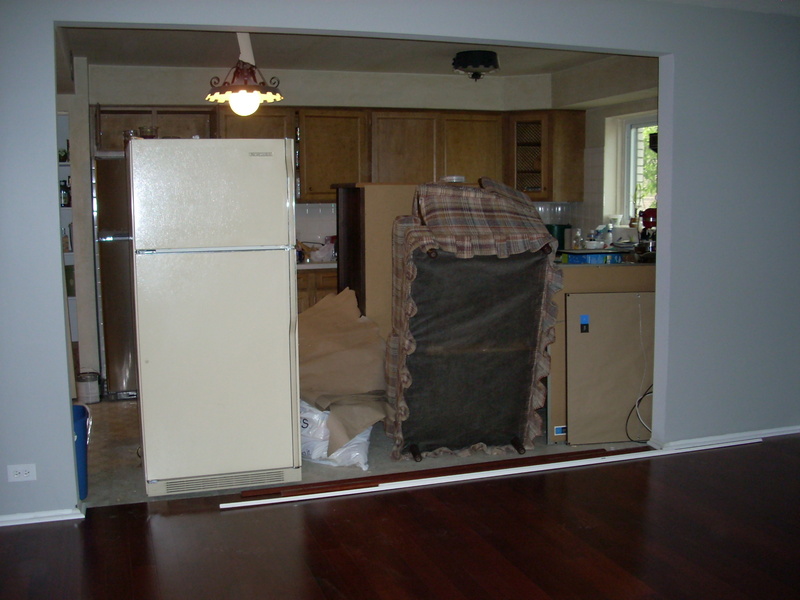 The previous owner had two couches, four chairs, numerous side tables and coffee tables and a medium-sized entertainment center in there. 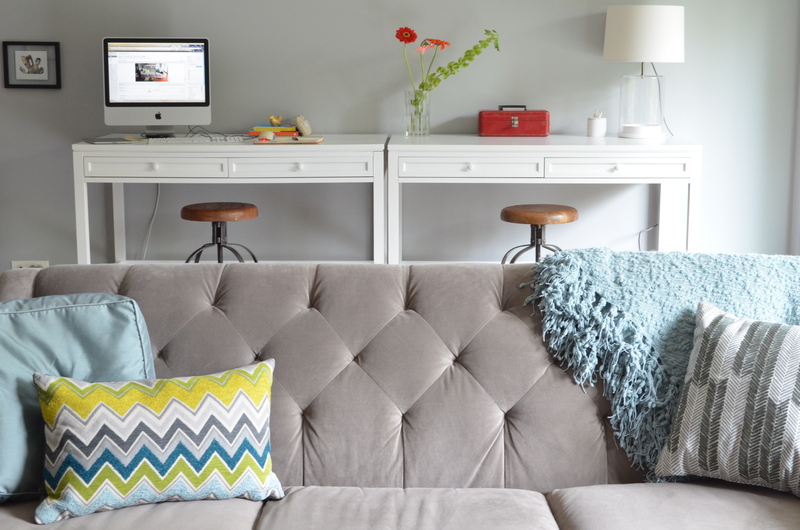 It seemed weird to place a bunch of furniture along the walls and call it a living room–there would be no way to carry on a conversation across the room–so we decided to use half of the room for our living room, and the other half for an “office”. (It took almost two years to decide this…we are nothing if not cautious decorators.) 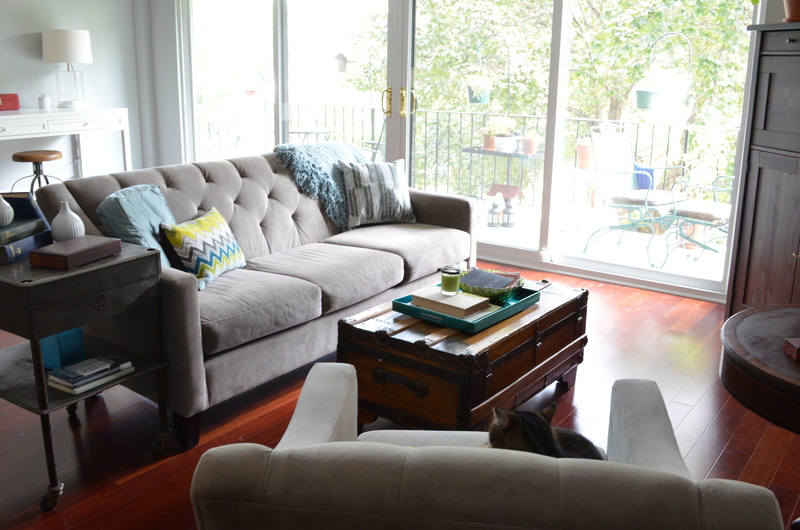 Although furnishing the living room has been challenging, the other changes to the room were the easiest of all. 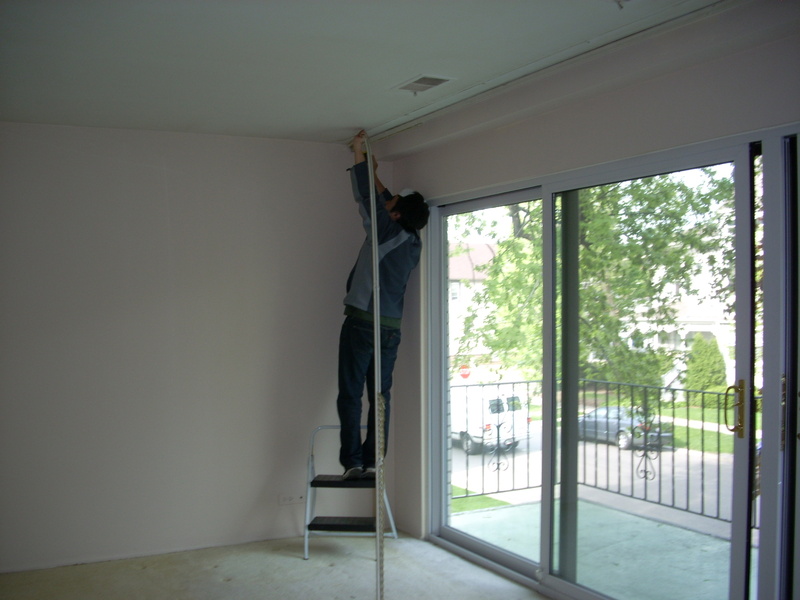 It was one of the only rooms in the apartment that was not wallpapered, so painting was a breeze. I did the walls and the trim on my own, and Naoto did the ceiling (because I have no arm strength). 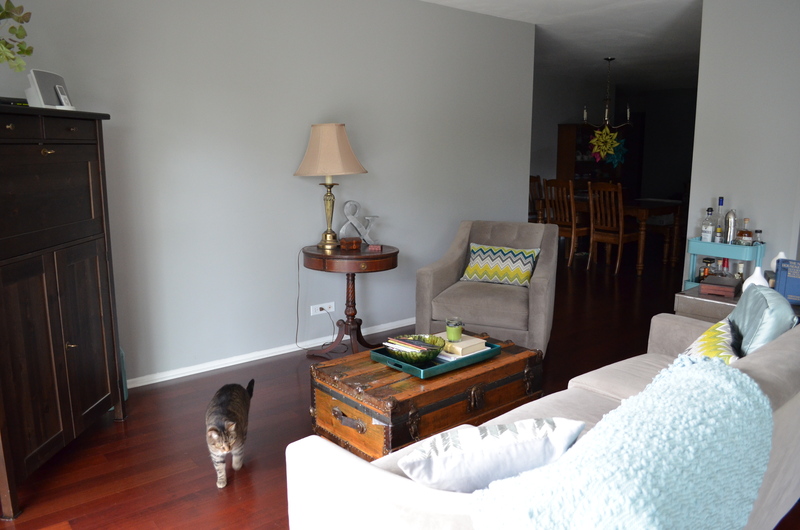 We chose a medium grey–Behr Classic Silver-and I have to say, it is my favorite grey of all greys and the color in our home that I love most. 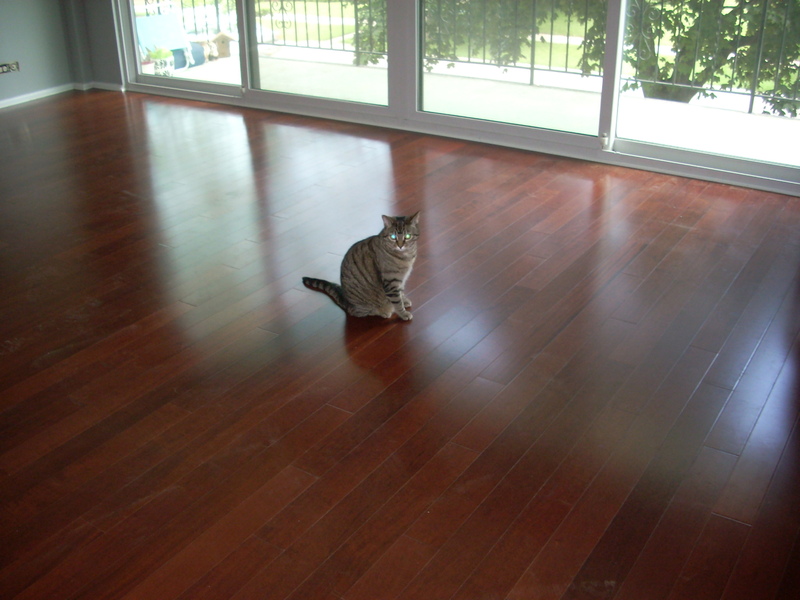 Once the painting was done, we had the carpets ripped out and hardwood floors laid. We are still waiting to buy a new (human-sized) TV and we are finalizing our “office area” and artwork, so things will move around and look more finished soon, I hope. 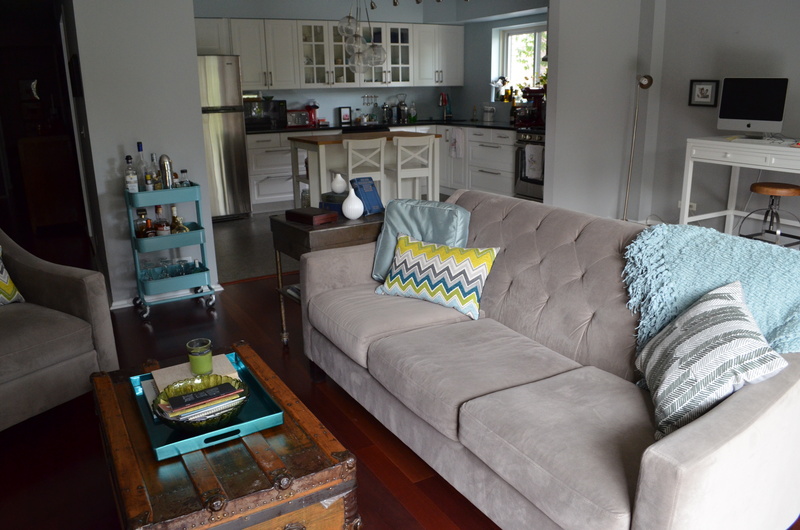 For the most part, the living room side has remained unchanged since we got our furniture two years ago…with the exception of the added vintage side tables and the “bar cart”. The couch and chair are from Macy’s. The trunk “coffee table” was an antique mall find from when I first moved to Oak Park into my dream courtyard apartment. Inside, the trunk is packed with fine paper that I’ve been hoarding for “future projects”. The wooden side table was a flea market find. I always wanted a round table with a little drawer like the Cleavers had in their original living room on Leave it to Beaver. (You can see their table on the tiny inset picture on the homepage.) I held out for a long time for the perfect table, and one afternoon, my parents called and said they’d found one…for practically pennies. It was worth the wait! The industrial metal cart was my first purchase from Yearbook here in Forest Park. It was the first thing I saw when Naoto & I first ventured into the store, and I had to have it. I didn’t have a plan for it, but I think it makes a nice side table for the room…and I never worry about coasters. The office area is completely new last weekend. 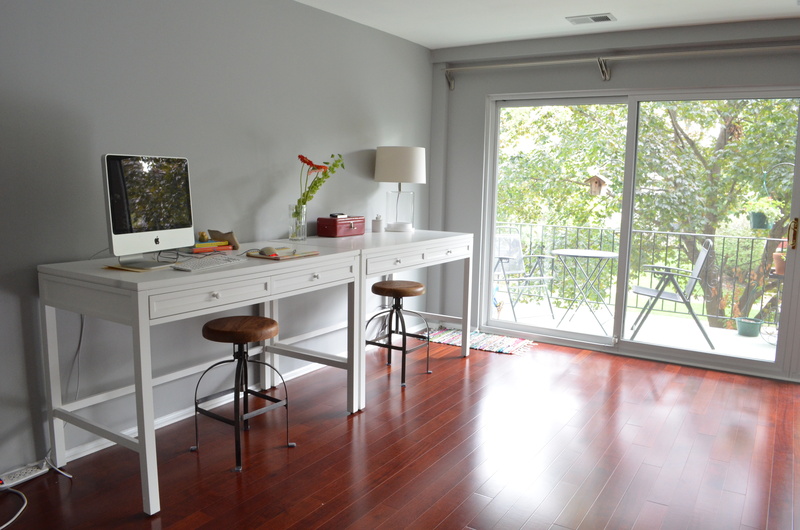 We are still deciding how we really want to situate the desks–which are really Martha Stewart craft tables from Home Decorators (we waited for a nice sale & got free shipping, because I’m “frugal”). I wanted something counter-height because sometimes it’s easier to stand and craft, and so Presley cannot jump up and “help” (a.k.a. ruin my projects) and these were the best I could find. I was worried about the white, but I think I can make them work with the dark wood accents of the rest of the room (and they are separate enough that I’m not sure it matters…) And the industrial looking stools are from World Market (also purchased with a sale + coupon combo). I like how they are a contrast to the clean lines of the white tables and that they are adjustable. I have to admit that it’s hard to resist spinning around on them…wheeeeeeeeeeee! So, that’s the living room for now. We are thrilled about it so far, but I really won’t be happy until I have some art on the walls. I have a plan for the living room side (some really pretty fine papers framed) but I have to wait until we get the TV and other furniture situated before I start hammering holes in the walls. Oh, and I’m going to frame my letter pressed print and hang it above the cocktail cart…super excited to have that in here! For the office side, I have a vintage time card holder and some smaller art pieces that will probably get haphazardly hung above the desks (collage-style) or maybe some shelves…not sure yet. And, since we have some extra room, the living room will probably get spread out a tiny bit, and hopefully we can fit another small chair or two for some extra seating. Naoto often sits on the floor, Japanese-style, but it would be nice for everyone to have a seat when we have company. And, finally, once all of that is decided, maybe we can get a rug. Maybe. Thanks for hanging in there for such a long post! If you have any ideas, I would love to hear them! Everything looks really nice. Have done a lot of work. Time & patience has paid off. I am a wee bit (whole lot jealous) it looks so great and comfy! Thanks 🙂 It’s nice when it’s all cleaned up 🙂 I need to remember that and clean it more often! love it Kim, you do such a nice decorating job, need to hire you. Wow! What a great room! Well done. I love the spacious feel of your living room, your office area is very inviting and you are absolutely right to wait with what to hang on the walls, you’ll know what is missing if anything when the rest of the furniture and tv have found it’s place. What a cozy space! Love it. How do you like your couch? I have the same one in pea green. I love our couch and so far it’s holding up well. I do find the chair difficult to “curl” up in…it’s a weird size, so I spend much more time on the couch. I bet it looks lovely & luxurious in pea green!